Symcon aims to boost vinyl sound quality | What Hi-Fi? Dutch company Symcon claims it can produce vinyl faster and with better sound quality, thanks to the process of injection moulding. Pressing vinyl is a slow process, taking around 16 weeks to get from cutting floor to shop. 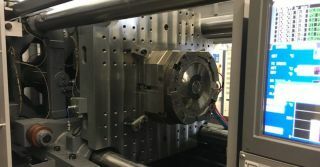 However, Dutch company Symcon thinks it can speed up the process and improve sound quality by switching to injection moulding, where plastic mixture is injected into a mould. The company, which specialises in CD manufacturing, is developing injection moulding technology, and has received a grant for the project, named Green Vinyl Records, from the European fund for innovation. Because plastic is injected into the grooves, it is more accurate than the conventional pressing method, claims Symcon's Harm Theunisse in an interview with Discogs. Records can also be produced faster - Symcon is aiming to reduce the whole process to two weeks - and there are also improvements in sound quality and a reduction in the environmental costs of manufacturing. However, the records aren't as durable as conventional vinyl, and the material costs are slightly higher. While pressing records is significantly faster - an average of 25 seconds compared with up to 40 seconds under the current process - Symcon still needs to reduce this to around 14 seconds to make injection moulding a viable alternative to pressing. Symcon isn't the only company looking to produce vinyl with better sound quality. Austrian company Rebeat is looking to create "HD vinyl" with "30 per cent more capacity, 30 per cent greater volume and double the audio fidelity of a typical LP".